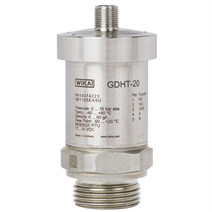 The model GDHT-20 transmitter is a multi-sensor system with digital output for the measurement parameters of pressure, temperature and humidity. Based on these measured values, the condition-related data can be determined. In order to prevent system failures in switchgear and, with that, network outages, the permanent monitoring of the gas density and moisture content is essential. The GDHT-20 transmitter calculates the current gas density from the pressure and temperature using a complex virial equation in the transmitter's powerful microprocessor. Pressure changes resulting from thermal effects will be compensated by this and will not affect the output value. In addition, the GDHT-20 transmitter delivers humidity or dew point information online, which enables monitoring within the terms of the Cigré guidelines and IEC standards. The RS-485 interface communicates using the MODBUS® RTU protocol. The instrument's output parameters and their units can be configured and read according to requirements. The GDHT-20 can be configured later by the customer for each defined SF6 gas mixture with N2 or CF4. Due to its high long-term stability, the transmitter is maintenance-free and requires no recalibration. Through the hermetically sealed weld seam and a measuring cell design without sealing elements, the permanent sealing of the measuring cell is ensured.